So I've been super, super busy recently. I feel like I'm always saying that but this time it's true. I've been pushing myself to the max the past couple of weeks because the hubs and I are moving--again! 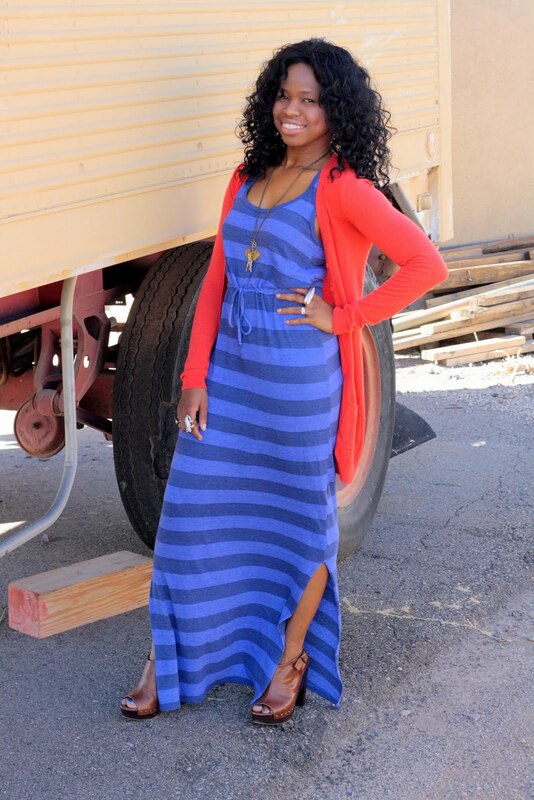 I got this maxi dress from Shopbop with a gift card that I won. Like everyone else, I want to have a go-to maxi of my own. My problem is that I'm very short and I can't wear them with flats, which means that a "go-to" maxi is now a "put on platform heels" maxi. But that's OK because I love the stripes and the ease. The dogs kept getting in my shot because they're way too used to being in front of a camera. Every time I ask my hubby to take photos for my blog he has to snap at least 100 photos of the dogs too. 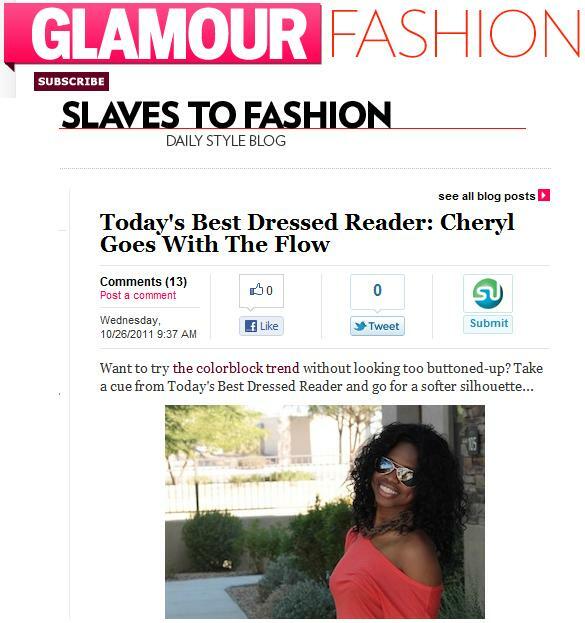 By the way, I was featured as the Best Dressed Reader on Glamour.com's style blog today! What do you think of my maxi look? Congrats on your Glamour feature too darling. I love your dress, that colour looks lovely on you and the slit at the bottom makes it! Wow, congrats on your Glamour feature, that's so cool and this Maxi dress is perfect on you. It's such a pretty color and I love the striped pattern. I always wish they were a little longer because I have to wear flats with them. hehe, Your lucky you can wear heels with them, looks very chic. Love that dress. I told myself I want to get into the habit of wearing more dresses! They're so easy, you just slip them on and go. That dress looks soooooooooo comfy! And congrats on your feature! That was one of my favorite moments when I was featured over there! You're moving away!?! I am sad :( ...San Fran sounds like a spectacular place though & I cannot wait to see pics/hear all about your time there. I may have to come visit you! When are you leaving PHX?? Ps your hair looks fabulous in this post! Wow, what an exciting move - moving is such a hassle though. Best of luck and love the dress! You look absolutely gorgeous!!! Good Luck with the move! SFO would be great!!! I already know it! !! And CONGRATS on the feature!!! You look gorgeous, I looove your hair like this. And that maxi is such a great colour. I'm like you and always have to wear heels though! Congrats and I love your outfit!! Plus you look stunning! Such a cute maxi dress! one of the most stunning maxi ever. Congrats on your Glamour feature, thats wonderful. Like your striped dress, the dogs are cute! Why do you move so often? Good luck in San Fran! It seems like a beautiful area. Love the color of that dress! So good on you! The colour combo looks so good on you. Nice feature too! Congrats on being featured... thats so awesome!! I love the stripes and your adorable dogs!! Also congrats on the new place...good luck on the move, enjoy your Friday! PS have you seen the giveaways were having! Congrats on the feature dear and how cute are your dogs?! Haven't I told you before that I find your dimples absolutely adorable! Love the new Maxi dress. The color is so good on you. And Congrats on being featured as best dressed. You look fabulous! Congratz hun, amazing color on you! You look beautiful. 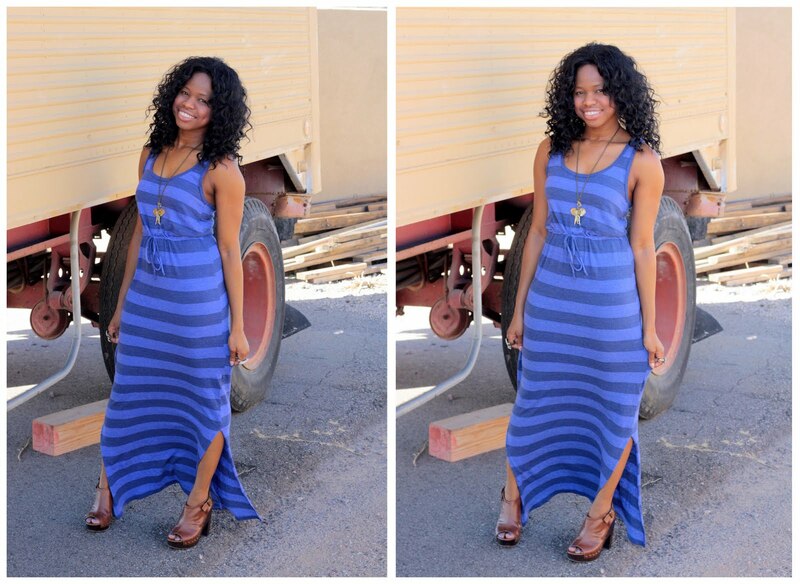 Love the maxi dress and your blog. You have great style and taste. Am now your new follower. Love this on you! I love San Francisco, amazing city to get to move to. It's my hope to end up there. 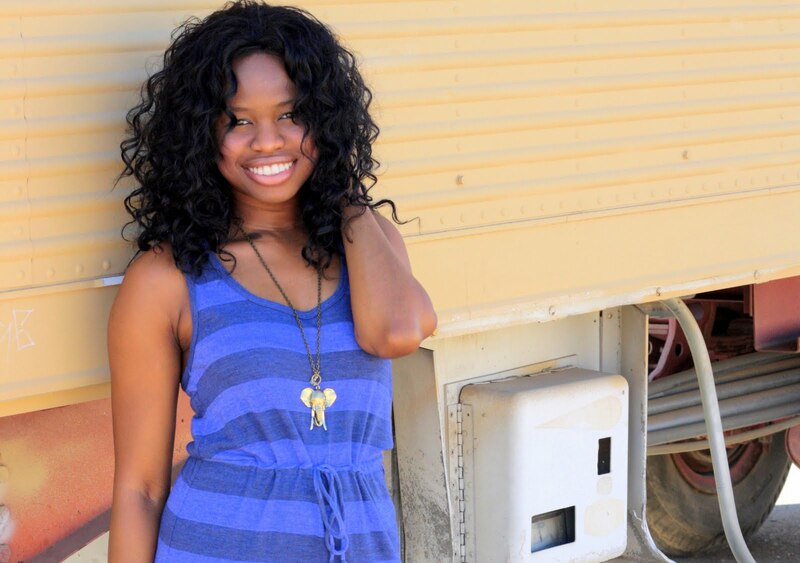 Her style is romantic, girlie and playful. This color looks gorgeous on you!! Congrats on being best dressed reader for Glamour! Tahts definitely something to be proud of :)!! I appreciate it very much. All Outfits are perfect! I have to agree with you, good design makes ordinary things extraordinary. Thanks to this....................!